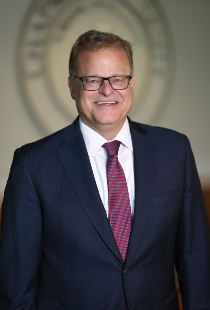 » Executive Vice President and Chief Operating Officer Harold W. Hewitt Jr.
Harold W. Hewitt, Jr. has served as Executive Vice President and Chief Operating Officer for Chapman University in Orange, California since 2007. His prior service includes: CFO for the Los Angeles Philharmonic Association, VP and CFO of Occidental College in Los Angeles, and VP and CFO of Whittier College. Harold’s current responsibilities include the management of Chapman’s Financial Services and Budgeting, Legal Affairs, Human Resources, Facilities Management, Public Safety, Risk Management, Internal Audit, Dining Services, and Bookstore Operations. He is primary staff to the Chapman University Board of Trustees’ Finance and Budget Committee, Investment Committee, and Audit Committee. He is a past member of the National Association of College and University Business Officers (NACUBO) Board of Directors, and past chair of the Western Association of Schools and Colleges' (WASC) Senior College and University Commission, the regional accreditor for California and Hawaii 4-year and graduate institutions. Harold currently serves on the WASC Review Committee. He recently joined the Board of the Lingnan Foundation, a foundation that awards scholarships to Chinese students who want to study at U.S. universities. Executive Vice President and Chief Operating Officer Harold W. Hewitt Jr.